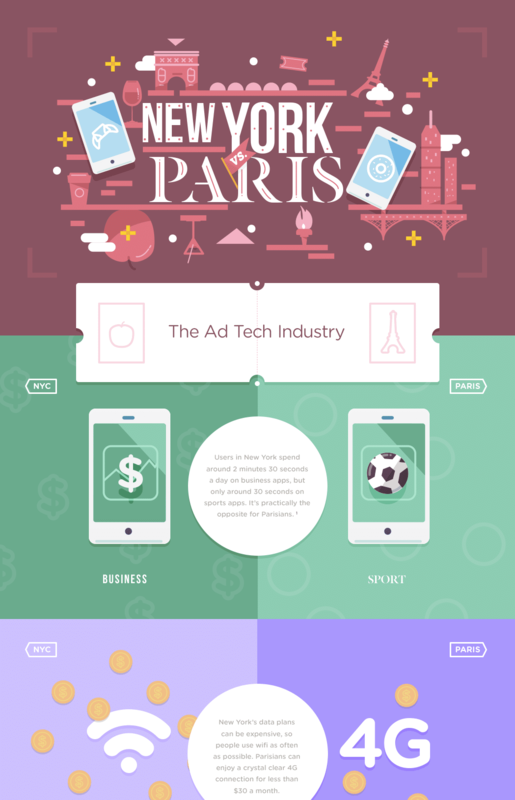 Inspired by graphic designer Vahram Muratyan’s blog-turned-book, Smart created a “New York versus Paris” infographic based on our observations of the ad tech industry. Ad tech is a global phenomenon, but the manner in which it manifests, how it grows and changes as well as the relationship it has with politics, economics and culture often depends much on location. Check out our infographic and you’ll definitely learn some surprising info! This infographic was first published by Mobile FOMO. New York vs. Paris: The Ad Tech IndustryUsers in New York spend around 2 minutes 30 seconds a day on business apps, but only around 30 seconds on sports apps. It’s practically the opposite for Parisians. (1)New York’s data plans can be expensive, so people use wifi as often as possible. Parisians can enjoy a crystal clear 4G connection for less than $30 a month.New York’s ad tech market is highly automated, while in Paris, publishers drive mobile innovation.New York creates privacy laws as a response to a problem, while Paris creates them before a problem arrises.U.S. digital political ad spending in 2016 will reach $1 billion, but in Paris the figure is $0, by law. (3)This year in the U.S., ad networks will sell 12% of total digital media revenue and ad exchanges 71%. (4) New York has a strong ad network presence, especially in mobile. On the other hand, in Paris, agencies and publishers actually know each other.